The shimmer of silk captivates even the most languid eye. But first, the cocoon of archival laws has to be unravelled and examined in fresh light. India is the world's second largest producer of silk, after China. All the four silk varieties -- mulberry, tussar, eri and muga -- are produced here. Karnataka is one of our traditional sericulture states and is the country's largest producer of mulberry silk. So it comes as a shock that some farmers rearing silkworms have uprooted their mulberry crops and planted tomatoes instead. Explains HP Venkatesappa, head of Karnataka's cocoon marketing advisory committee: "It costs Rs 90-100 to produce a kg of cocoon but the current selling price is only around Rs 60-70 a kg and farmers have to abandon this trade." The state government controls the price of cocoons, which has fallen sharply -- from Rs 150 per kg four years ago to less than half that figure now. In the Kolar cocoon market, the usual crowd of reelers -- the daily customers for the cocoons -- is thinning out by the day. Of the 1,500 licensed reelers registered with the cocoon market, barely 250 turn up. At the government cocoon market in Ramnagaram, one of the largest in Asia, cocoon arrivals have gone down by 40 per cent in late 2004 over that of last year. The 10th Five Year Plan had fixed a target of 24,500 tonnes of silk production for 2004. But Joy Oommen, Central Silk Board (CSB) member secretary, admits, "It's more than ten months into the year, and the target looks quite distant." Domestic demand for silk hovers around 23,000 tonnes while production during 2003-04 was 15,700 tonnes -- this agro- based industry has clearly not been able to get on its feet. Meanwhile, Chinese imports rose from less than 3,000 tonnes to over 7,000 tonnes in the last three years. Government is under pressure from the weaving industry to allow the import of raw Chinese silk. But this import, which helps the weavers and traders, destroys the abilities of the cocoon growers and farmers to compete. Even an anti-dumping duty on Chinese raw silk has not helped, with traders finding many ways of bringing in the cheaper fibre into the country. India silk sector is a large employer. CSB estimates the entire chain of silk production -- silkworms to manufacturing the fabric -- employs nearly 8 million people in 26 states on a full-time basis. The same capacity could absorb another 3 million people, provided the market picks up. What hinders higher production is the absence of quality silkworms, use of outdated technology and complete neglect of the non-mulberry sector. According to K N Ramadas, additional director, department of sericulture, "We have only two or three races of silkworms to fall back on. In comparison, China has 600." China has also invested into developing quality silk based on bivoltine hybrids. 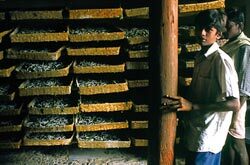 We lag despite a programme to develop better quality silkworms dating back to the 1970s. According to an estimate by the United Nations Development Programme, each kg of incremental production at the cocoon stage provides full employment for a year to one worker. The silk board estimates that one acre (0.4 ha) of mulberry plantation could generate employment, till the final silk mulberry weaving stage, of 1,000 person days -- in other words 3 people could get full employment with this plantation. The problem is finding the land to plant the trees, which can then host the worms. The non-mulberry silk sector, which sustains the poor living in and around forests, is dependent on growing worms on trees in forest lands. Forest departments term the collection of cocoon from natural forest as NTFP extraction and restrict its collection and trade based on the state laws. The Forest Conservation Act, 1980, allows tussar cultivation, without the plantation of monoculture species, as a forestry activity. The act requires that if trees are to be planted for silk rearing, at least 3 different species be planted and that no single species cover more than 50 per cent of the total planted area. The act also specifically disallows the plantation of mulberry silkworm rearing as a non-forestry activity. These provisions, per se, are not limiting. The problem is the implementation of the act gives the forest department enormous discretion in permitting people to work in the forest. The problem also is that the forest area is declining. Consequently the trees that could breed these worms are also disappearing. To compounds things further, state governments monopolise the silk trade through legislations. For instance, in Karnataka, it is illegal to own a silk worm, a cocoon and even raw silk, unless you have a license given by the state's sericulture department. All in all, a story, not made for success.